WASHINGTON – In the days and weeks ahead, potholes will bloom on area roads as predictably as flowers in spring. Driving into a pothole can cause a blown tire, a bent wheel rim or worse yet, damage to the car’s suspension system. Many motorists may be unaware that they can submit pothole damage claims to the government agency responsible for maintaining the road and thus obligated to fill the potholes. “There is a process for filing a claim and drivers do have a right to file that claim,” says Jenni McCord, public affairs officer for the Virginia Department of Transportation. “Winter is conducive to potholes,” says David Buck, media relations manager for the Maryland State Highway Administration. The rain and snow, changing temperatures and salt all contribute. Damage from potholes on Virginia state roads are handled by VDOT’s customer service center, which can be reached at 1-800-367-7623 or online. Damage claims in Maryland are filed with the Claims Department at the Maryland Treasurer’s Office. The number 410-260-7684 or 888-942-0162. The office can also be contacted online. But if the pothole is not on a state road, the motorist would have to contact the individual county’s department of Public Works or Transportation. 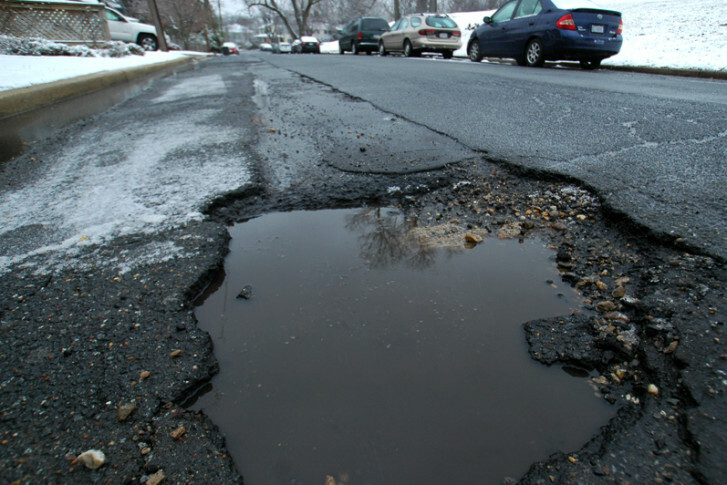 Claims for pothole damage on D.C. streets are filed with the Office of Risk Management. But there may be a faster and better way to get a care repaired or a tire replaced. “They are governmental claims and they are very, very, very slow in being handled,” says Attorney David Tompkins of Bethesda-based Lewis and Tompkins PLC. There’s another hurdle to getting the state, county or city to pay. The claims will be thoroughly investigated. “Potential factors that are considered are: had the pothole been previously reported; was VDOT aware of the pothole or was it already on our list to be filled; and did crews have enough time to fill the pothole?” McCord says. Attorney Tompkins says to win the claim motorists have to show what the state, county or city did wrong. “Most of the jurisdictions that I’ve dealt with have had a pretty dim view of whether you can prove that or not or whether you’re just somebody trying to get the county pay for your flat tire,” Tompkins says. “Cars are already going to have some wear and tear on them as it is, it’s going to be a difficult proposition to prove that a flat tire came necessarily from a pothole,” Tompkins says. Tompkins advises his clients whose vehicles have been damaged by potholes to file a claim with their own insurance company. “They’ll have to pay their deductible, but they’ll get their car repaired faster so they can get back to getting to work and taking their kids to school without having to wait what could be months to get their car fixed,” Tompkins says.